How many of us actually trust the built-in uninstall programs that come with our operating systems? Most times, they just remove the main program and leave a ton of junk files and data littered across the hard drive. That’s why you need to own today’s discount software promotion, Soft Organizer! Soft Organizer lets you completely detect, uninstall, and remove traces of programs, while checking for new program versions automatically. 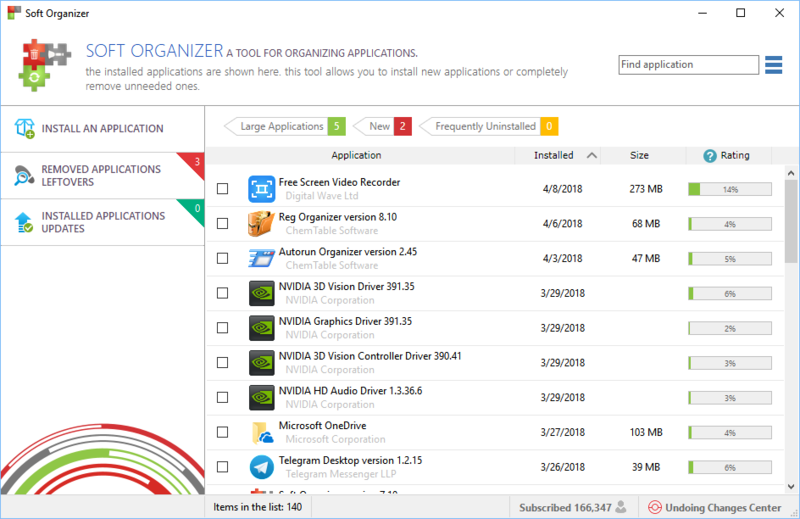 With Soft Organizer, you’ll not only be able to cleanly remove programs installed prior to Soft Organizer, you’ll be able to install new programs going forward while recording all system changes, to empower complete and total uninstalls. And in case you have programs that aren’t being tracked, Soft Organizer comes with a powerful search function that finds all traces of any program that you specify. Do you have a graveyard of old applications that you used once, but found to be terrible? Soft Organizer rates your apps so that you can identify and delete unused and low-quality programs! After you purchase Soft Organizer it may be used indefinitely. Soft Organizer is licensed per user, so if more people are going to use Soft Organizer you will need to purchase additional copies. Each license allows installation on 2 computers, but Soft Organizer may not be used at exactly the same time on each of them. Does this software come with an expiry date and, if so, what happens to the save installations (Such as "Can the saved installations be completely removed? but did not notice your purchase. This means that you probably used another BitsDuJour account to purchase the product. If so, could you please let us know at notify@bitsdujour.com, the email address associated with the BitsDuJour account you used to participate in the promotion? or in one of your other 2 customer accounts (depending on which customer account you are using to participate in this promotion). Then once that purchase will show up in your account, I will be able to resend you the receipt email if you don't receive it. If I don't see the receipt email in the Purchases page then I cannot (actually no one can) resend you the receipt email. Please notice that by going to the Purchases page you can also have your receipt email resent to you if that receipt is in the Purchases page. You must first go through the purchase flow of this promotion so that the purchase of this product will appear in your Purchases page. Once the purchase appears in the Purchases page I will be able to resend you the receipt email. Lonera Nice program, i already own it, version 6.15. What is the version number of this giveaway? B User Sent21 @Melchisedek: From what i saw after downloading the installation file its version is 7.10. If you already have an older version installed, just hit update program (within your current older program) and insert the new key. This is a FANTASTIC installer program !!! Toni User Thank you so much for this giveaway! One of the best uninstallers on the market, you just have to "teach" it a bit (add scanning stuff to exclusions) and it's great. The developers are also nice persons, and answer to your questions on their forum. Jay Softer How long is the license valid for? I have version 6.15 with the lifetime license, which I got from another site a year or so ago. I am just wondering what will happen with version 6.15 if I download and install today's version (7.1). Will it install over the earlier version? Will I loose the lifetime license that came with version 6.15? You raise a good question. I suspect it is also a lifetime license. Perhaps you might want to touch base with the gang at Soft Organizer and ask.